I’m ready for a bright day — a bright, Spring day! How about you? Well, since I can’t have that quite yet, I’ll have to settle for some bright, happy colors on a card. 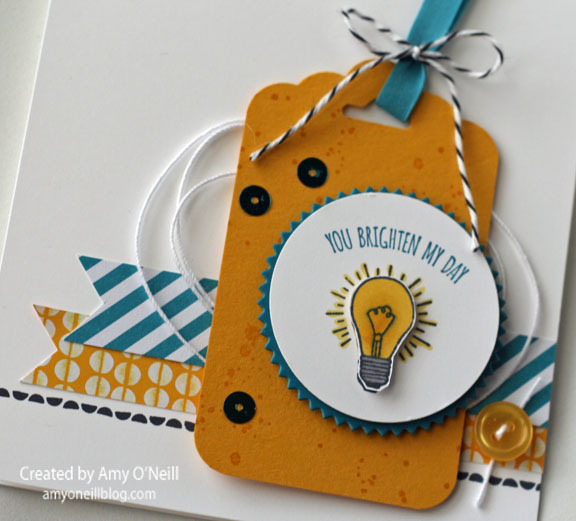 I’ve used a fun Sale-a-Bration set, You Brighten My Day, for this card. 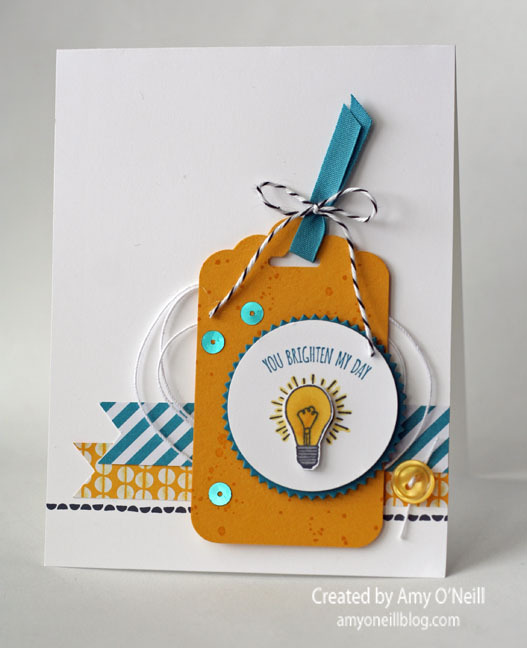 I made a little tag with Crushed Curry card stock and stamped some Gorgeous Grunge splatters. I used a fun stamp set that I got not too long ago but hadn’t used yet, Borderettes, to stamp the little line of semi-circles at the bottom of the card. I’m looking forward to using this set more — I love all of the different patterns. The dsp is from Birthday Bash and All Abloom. I hope you have a bright day! Thanks for stopping by! Here’s a super simple card for you today. 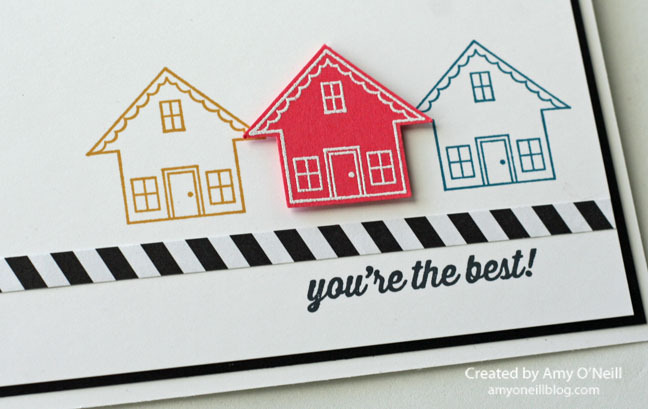 When I saw this cute little house in the You Brighten My Day stamp set, which is available for free during Sale-a-Bration, I may have squealed with delight. I love how it coordinates with one of the arrows in the What’s Up punch. 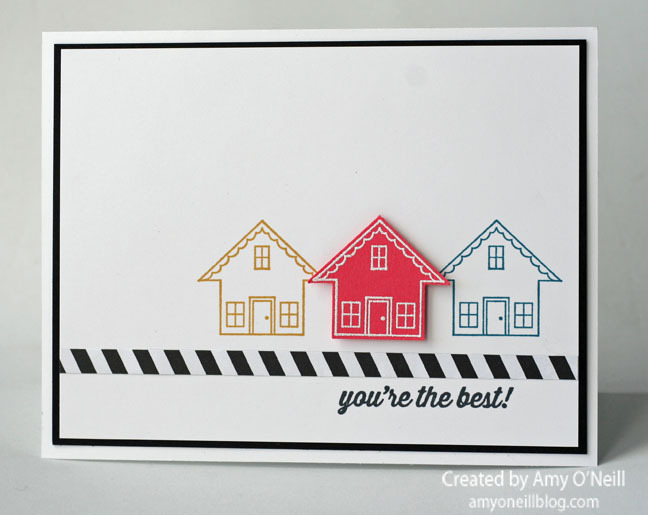 I stamped it three times — twice directly on the card base using Island Indigo and Hello Honey ink. The third time I stamped on Strawberry Slush card stock with Versamark ink and embossed with white Stampin’ Emboss Powder. I punched out the Strawberry Slush house and popped it up with a dimensional. I added a little strip of dsp from the Back to Black dsp collection and stamped the sentiment from Simply Wonderful, another Sale-a-Bration set. This was really quick and simple, but I like how it turned out.